Editor’s Note: Alternate title was “How Could I Just Really Kill a General” but figured kids these days wouldn’t get the reference. That’s something I’ve been wanting to do, more music titled posts. I think that last week’s experiment was a success. There were a number of good responses, and I figured that this was a logical followup to the topic of Generals. Getting rid of Generals can be a huge turning point in the game, especially if your opponent’s deck is built around him/her. Now, we’re not talking about killing a General like with Doom Blade or dealing it damage, but removing it from play. Every color (believe it or not) has ways to deal with Generals. What we’re going to do find find out some of the best ways to do that. Yes, this will be some of the better cards you should be playing with in this format. Why am I not caring about “destroy target creature” cards? A) They’re boring B) The majority of them are in Black C) Not only can you deal with Generals, but if you’ve got anyone who landed their Eldrazi or Darksteel Colossus, this is also a great way for dealing with them too. There’s a variety of ways to get rid of Generals without triggering different cards; Sometimes you don’t want that Grave Pact to trigger. Don’t be surprised to see these cards in decklists all over the net. Please remember: when I card says “Exile” and you do that to a General, they can decide to put it in the Command Zone. It’s the same thing that if you kill a General, they can put it in the Command Zone instead of the Graveyard. While I don’t agree flavorfully about it, it’s still the way the rules work. If that happens, they do have to pay the additional 2 colorless mana to re-cast them. Here’s the list of non-lethal ways to get rid of a General. My personal Top 5 are after the list. I decided not to include permanents that deal with attacking or blocking creatures because it’s a great bluff but most of the time players won’t swing with that on the table. Some of these can’t fit into every EDH deck because of color restrictions in their activation. If you’re playing a deck that can allow for these colors, I would highly recommend thinking about putting them in there. It’s going to be no surprise when you look at this list that it’s going to be the most popular color for this type of effect. Yes, most of these are exile type cards, but in a color where that’s the removal most of the time, it’s not going to be a surprise to see it filled up with such playables. There’s plenty of different types and strategies you can do with the cards in this color so if you’ve having trouble with some of the Generals in your area, I would suggest to see what can be taken from here. Absent from this list: Flicker type effects. What’s not included on this list: bounce. I wasn’t going to include every single card that returned a creature or a permanent to it’s owners hand. Besides White, this is going to be the most powerful color when it comes to dealing with Generals. Remember, if you return a General to an opponent’s hand, they can pay regular cost for it, so keep that in mind. While it would be the undisputed king of killing, it doesn’t have too many cards to just get rid of creatures. There are some good ones here and powerful effects but if you’re playing this color, most of the time you’re making other players sacrifice or just flat out killing their Generals. There’s nothing bad about that, just doesn’t fit with this theme. White (unsurprisingly) is in almost all of these cards. Some of these are good, some are bad, but they all can turn the tide in games when played correctly. Three cards are mass effects. Red burns things, not removing them from the game for fun. The fourth (Dead/Gone) is included because Red doesn’t bounce all that often, unlike Blue. I didn’t include the Red burn spells that said “exile if they would go to the graveyard” because that’s what they would be doing anyway. Where’s Green’s cards? They really don’t have any (EDIT: As it’s been pointed out in the comments, there is something, Lignify. It doesn’t get rid of the creature for the battlefield, but it will have to do for Green). Sure, the can do some damage everyonce in a while, but Green can’t really deal with creatures (consider it a color weakness). What can mono-Green Generals use? Why, artifacts, of course! These are in no certain order. I try to have my deck at least fit one of these in there if possible. Duplicant – Fits in any deck, and if you recur it through bouncing or returning it from your graveyard you can remove multiple Generals. Must in mono-Green decks (again, because of the lack of removal and can be fetched with Fierce Empath (awesome tech). Swords to Plowshares/Path to Exile – Put them both here because although the benefits to the opponent are different, they’re both practically the same thing. If you’re playing White but not playing one or both of these, you need to fit them in your deck. Oblation – People will complain that it allows the player to draw two cards. Don’t worry about it, it’s not that big of a deal if you shuffle the General into your opponent’s library; the chances of them drawing it from those two cards are small. Plus, if you need to, you can use it on yourself to save something of yours. Yes, it’s a really really good card. Spin Into Myth – It’s the Fateseal that really pushes this card over the top. You can then put the creature on the bottom on the library plus another card. And (most importantly) it’s an instant, so you can screw over a Vampiric/Mystical/Enlightened Tutor and their General at the same time. Hallowed Burial – Has seen more and more EDH play. Was used to get rid of persist, but now, just gets rid of Uril. What’s plan against Uril: 1) Get to 5 mana, 2) cast Hallowed Burial, 3) ??? 4) Win game. Seems pretty good to me. I’m sure there’s some that I missed. Comment down below about ones you like and ones I missed and I’ll add them up here. Don’t just give me bounce cards either. 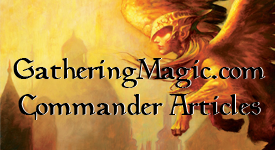 This entry was posted on Friday, May 28th, 2010 at 11:58 am	and posted in EDH, Magic: the Gathering, Really Long List. You can follow any responses to this entry through the RSS 2.0 feed. « Weekend Commentator Diversion – Most Hated General? In Blue: shouldn’t you also include Hinder, Desertion, Gather Specimens, copy effects, and control magic effects? In Red: it’s worth mentioning that red has a lot of effects that steal creatures and then you could have a sacrifice outlet like Goblin Bombardment to kill the creature. Counterspells have been ignored in this conversation since it deals with them proactively and not when they’re in play (maybe why Blue has such few answers besides bouncing). But they will be covered another time. As for stealing (in General but mostly Red), I was thinking about it too but in Red it’s temporary and unless you have a sac outlet, it doesn’t mean a thing (’cause it ain’t got that swing Fling). Oh come on! Nothing for green? Lignify cost two mana! And hits everything but Uril. Lignify, see, I thought I missed something. Oblation also works great on control magic effects since its the creatures owner that draws. Capsize should get special mention as a ridiculous lock against expensive generals, even hasty ones. I’d put Utopia Vow in green. If you are playing mono-green, everything that stop creatures is needed, even if it has a drawback (like giving them 1 mana, what in late-game probably it’s nearly useless). Why exactly are you listing ‘Exile’ cards here? They do not serve any functional purpose against a general other than to delay him a turn. Why even print those if they can just move their general to the Command zone and re-cast him? Cards like Hinder or Desertion absolutely should be on this list, while cards that just require the opponent to recast their general (removal or exile) should not be. Why list Whirlpool Whelm (only delays them a turn)? If you’re going to list off cards that exile, you might as well list off all direct damage ever, since they have more or less the same effect. Duplicant doesn’t seem like it works either, since it exiles (and they can immediately respond to the exile by moving the general to their command zone). Cards like Oblation, Condemn, Spin Into Myth or Bant Charm are really the -best- way to deal with generals. It destroys (and thus per the title of the article is not included). It is sort of confusing since exile effects are present on this list (which honestly accomplish the same bit of nothing against a general in EDH that destroying him/her does). Gotta agree with busdriver. You can’t call exile cards better answers to generals than destroy cards. They accomplish pretty much the same thing. The only difference is that with a destroy card, they get the option of using graveyard-based triggers/recursion. This makes exile superior to destroy – but not much. The really good answers to generals involve ‘tucking’ them – Hallowed Burial, Hinder, Spin into Myth, Condemn, Bant Charm. Neutralizing them on the field with auras is often better than flat-out destroying them, so Lignify, Pacifism, Faiths Fetters, all are reasonable options. Making them work for you is also a great solution, via control magic or other steal effects. I don’t think the point is to exile generals, although that is part of it. I believe the point is to get rid of generals that are indestructible or have something along the same brand as indestructibility. Also, you have to consider the necessity of being able to get rid of creatures that you don’t really want going to the graveyard, i.e. Magma Phoenix. These kinds of effects are needed for all creatures, not just generals. Also, in defense of the glorious writer/editor/master of this site, I’m fairly sure Robby knows that Generals go through the same process exiled as they do destroyed. He even said so in his post. Konda, Sapling of Colfenor, and Ulamog are the indestructible generals. I’m not really sure that any of those are playable quality (and thus would warrant the inclusion of such a suite of Exile cards). I like the blog/site, and this isn’t an attack against your pal, but I just don’t get why he has included exile cards, or why Hinder isn’t included. The article is about how to remove generals, not how to remove random creatures that have nasty ‘enters the GY’ effects. +1 for Lignify. Super secret tech in mono green. If you o-ring a general, and they send it to the command zone, can they cast it again or will the o-ring exile it again? Much like Duplicant (or any exile effect), O-ring doesn’t do much to generals. O-ring’s exile effect happens once, upon entering. Wouldn’t desert twister and Mold shambler also work for green? In blue there is also Faerie Trickery. Card Text:Counter target non-Faerie spell. If that spell is countered this way, exile it instead of putting it into its owner’s graveyard. But yeah, Hinder is better. I finally ramped up to Uril only to find my opponent waiting to send him to the bottom. Yeah I don’t think I won that one. lol. Anything that makes an opponent Sacrifice (especially good against Uril’s that have low creature counts) Consuming Vapors comes to mind. It strikes me as a little bit odd to leave out neutralization cards such as Utopia Vow from a supposed who’s-who list of general removal. Granted, Auras don’t truly remove a General from play, but for 1G Vow can turn Blighty from a poisonous flying zombie-dragon to a really scary looking removed-from-combat Birds of Paradise.